Paradise has a name - Khao Lak. 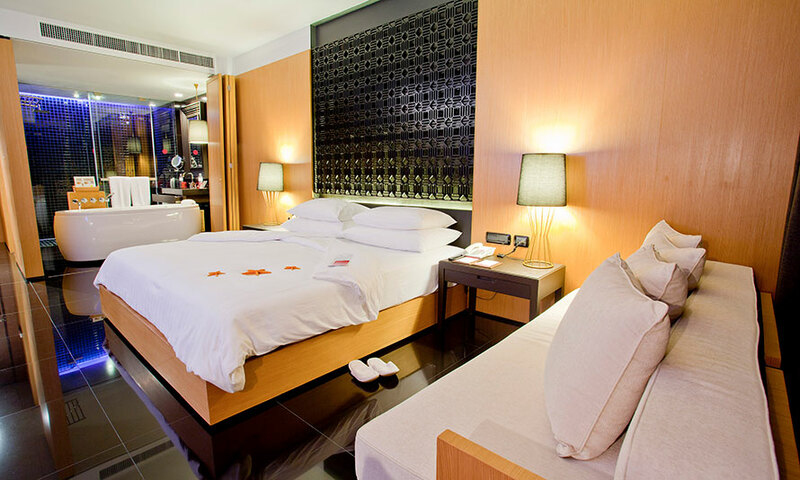 Situated in the stunning Phang Nga Province, just an hour’s drive north of Phuket, this laid-back beachside getaway is one of Thailand’s best-kept-secrets - and the Ramada Khao Lak is perfectly situated to experience all this wondrous region has to offer. Unwind with seven nights of bliss in a Deluxe Oasis Room or Deluxe Jacuzzi Room for two people, depending on your option chosen, and enjoy daily buffet breakfast, a three-course set dinner, a relaxing 30-minute massage per person, welcome drink on arrival, airport transfers and more. See the full list of inclusions below and start planning your Khao Lak escape today! Renovated in September 2017, the Deluxe Oasis Rooms feature a spacious balcony that gives you excellent views of the Pool and the grand lawn. Each room includes a rain shower and bathtub. 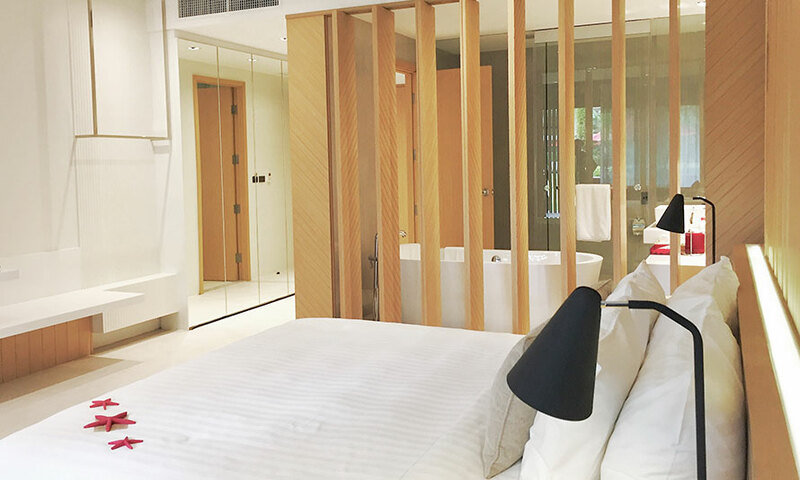 The Deluxe Jacuzzi Room features a modern, contemporary design with a touch of Thai flair, and opens out onto a private terrace or balcony. All rooms have a bathroom with optional sliding door, creating extra space and allowing you to enjoy movies on the 40″ LED TV from the Jacuzzi. A contemporary beachfront resort fronted by pristine sands, surrounded by lush tropical foliage. With luxurious accommodation, sumptuous dining choices, rejuvenating spa treatments and more, this fabulous resort is the perfect escape for couples or families to relax and escape the world. The resort has facilities to keep all ages entertained. Nestled on the beachfront in Khao Lak, Ramada Resort is a fantastic destination only an hour drive from Phuket International Airport. The resort is situated in Bang Niang Village, a thriving community where local markets, restaurants and bars are within easy reach. Renowned for its lush rainforest and incredible diving, Khao Lak makes a perfect alternative to the more crowded resort hotspots to the south. Please note: High Season Surcharges are to be paid directly to the hotel upon check-in. An unlimited number of vouchers can be combined. Please note: extra nights are subject to availability until confirmation with the property. - Infants 0 – 4 stay free of charge at the property, sharing existing bedding with parents. - Children are classed as 5 – 11 years old. - Children 12 – 17 are classed as adults. - Any additional adult sharing a room will receive all inclusions stated in the deal offer. - Some room configurations may require the use of existing bedding (subject to availability). Deluxe Oasis: King bed or 2 x queen beds (subject to availability). - Welcome drink can be chosen from a home-made herbal drink or fruit juice. - The return airport transfers are between Phuket International Airport and Ramada Khao Lak Resort on the arrival and departure days only. All bookings are non-refundable and cannot be redeemed for cash. We recommend you take out a comprehensive travel insurance policy immediately after making your booking to cover you against cancellation. We will not be liable for any costs or losses incurred in the event that you cancel your booking. Any changes to your booking, including but not limited to departure date, tour length, passenger name/s, and flight ticketing requests, are subject to availability and may will incur charges. Please refer to the Schedule of Fees at the end of this document for further details. All cancellations must be provided in writing/email by the person who holds the booking, this cancellation needs to be confirmed by an employee at TripADeal. Thailand has a tropical monsoonal climate. It is warm/hot all year round, but it is hottest from April to May. Humidity is high, at this time, which can make the days feel even hotter. September - October is also the wettest, thanks to the southwest monsoon. A 30 day tourist visa is granted upon arrival if travelling on an Australian passport.